While in Playa del Carmen, don’t miss this action-packed tour featuring ziplining, rappelling, and off-roading in an ATV. 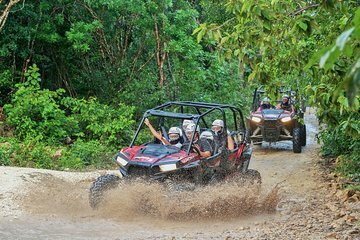 Drive your Polaris, an all-terrain vehicle, through the jungle, and then rappel down into a cenote through an opening big enough for one person at a time. Discover a beautiful subterranean world, where you zipline into cenote waters. Your jungle expedition includes a visit to another cenote for cliff-jumping and snorkeling. Hotel transport is included on this tour. Cenotes, natural sinkholes formed over thousands of years, are key elements of the ancient underground river system that make up the Riviera Maya. On this tour, you’ll visit two strikingly different cenotes: a cavern cenote, closed except for an entry hole in the ceiling, and the other is an open-air cenote, bright with sunlight. After hotel pickup in Playa del Carmen, start with a jungle hike before boarding your Polaris UTV. Test your off-road driving skills through challenging terrain, cliffs, and valleys. Park your Polaris near the first cenote. With the help of your guide, you’ll rappel down into the underground cavern, through a hole just big enough for a person. Admire the rock formations as you make your way down. Inside the cavern, speed along a double-security zipline cable and splash into clear cenote waters. Reboard your Polaris for another off-road excursion that will lead you to the second cenote, where you can cliff-jump, snorkel, or just relax. Your tour ends with drop-off back at your hotel.